When I learned I'd won this book as a giveaway on Booklikes I couldn't help jumping for joy, then waited with bated breathe until the wonderful day when it arrived for my perusal. Oh, the wait was so worth it, the writing of Ned Hayes' debut mystery novel is so very good, so much better than I'd dared to expect that I found myself both delighted and surprised. 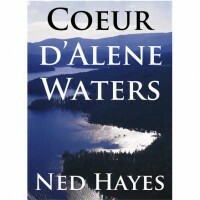 Late one night a dismembered body was discovered in the washroom of a luxury resort near the beautiful Lake Coeur D'Alene in the Pacific Northwest. Matt Worthson, a recovering alcoholic who has lost the respect and backing of his fellow officers, was assigned to investigate and find the killer of the victim, Arlen Bowman, chaplain for the city's police force. Right from the beginning Matt runs into problems, coverups, secrets withheld from him and secrets he himself is guarding. With guilt eating away at his confidence and self esteem, he is determined to solve the murder despite the obstacles placed in front of him, including being assigned the case by corrupt officials who thought him controllable. The story unfolds very slowly with side trips to the Sunshine Mine fire disaster that happened nearly 20 years before the murder and the introduction of seemingly random characters and their stories, but as the book progresses, it is all brought together and dark secrets are revealed of what happened at the mine fire where 91 miners perished. There was never a moment before the end that I thought I had figured out who killed Arlen or why he had to die. I took my time reading this dark, gritty mystery as the tension would build so high I had to walk away for a bit before feeling able to once again return to it. I felt helpless as the walls were closing in on Matt and wondered how and if he could prevail. Hayes did a masterful job of keeping ones interest and the suspense throughout. This book has it all, corruption in a small town, guilt, greed, mistrust, betrayal yet also love, hope and redemption. I highly recommend to those who love a good historical mystery. I am so looking forward to reading more by this very promising author.